Increase comfort and safety with this Shower Chair with Backrest. Ideal for showering, the durable, lightweight aluminum frame easily positions in any bath or shower stall. Rest comfortably while cleansing on the blow-molded plastic seat and backrest. 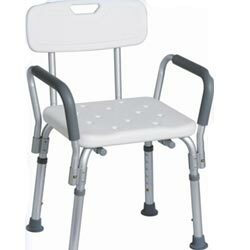 Enjoy the comfort and peace of mind offered by using the Shower Chair with Backrest in your home or medical facility. The sturdy frame and comfortable, non-slip seating ensure a pleasurable daily hygiene routine free from the worry of treacherous slips and falls.